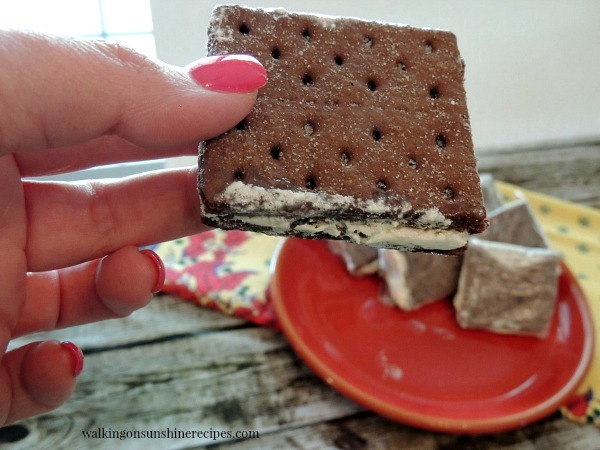 Try these Cool Whip Frozen Graham Cracker Sandwiches for when you’re trying to watch what you eat but you still want something sweet! Cool Whip Frozen Sandwiches will help satisfy your love for ice cream while following a low calorie diet! Do you love ice cream as much as I do? But if you’re watching what you eat, enjoying ice cream is something you probably don’t do as much as you want to. Today I’m sharing with you a treat that I have been making for years. I found this recipe when I was on Weight Watchers YEARS ago. 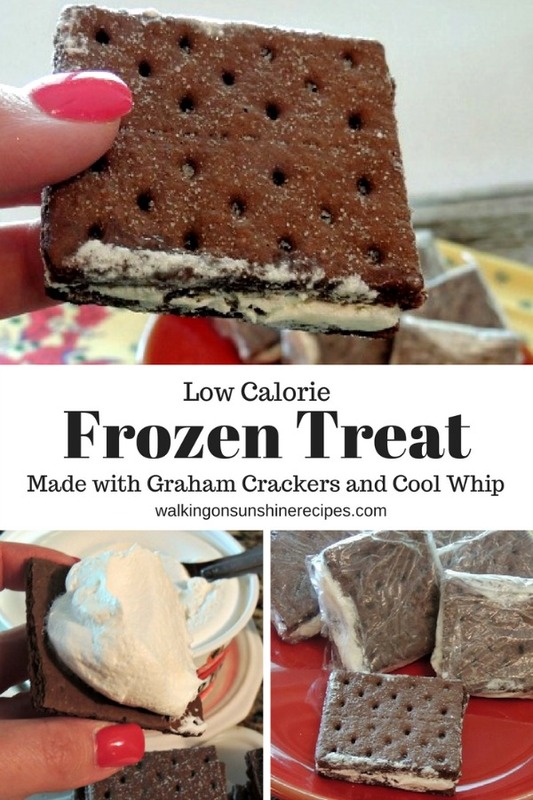 It’s a very EASY and delicious frozen treat graham cracker sandwiches made with Cool Whip and without all the calories from real ice cream. 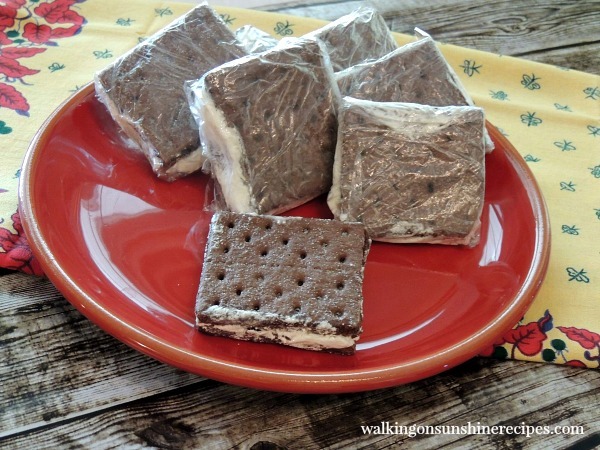 You can use either chocolate flavored graham crackers or regular flavored crackers. 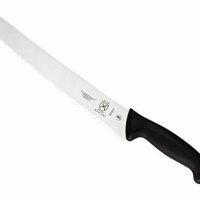 I find using a serrated knife helps to make sure the crackers break evenly along the perforated lines. I love to stir in a tablespoon or two of peanut butter into the whipped topping before spreading it on the crackers. It helps to “flash freeze” the sandwiches first on a baking tray in the freezer before wrapping in plastic wrap. Try different flavors of whipped topping! You can even add mini chocolate chips or sliced strawberries…the ideas are endless! 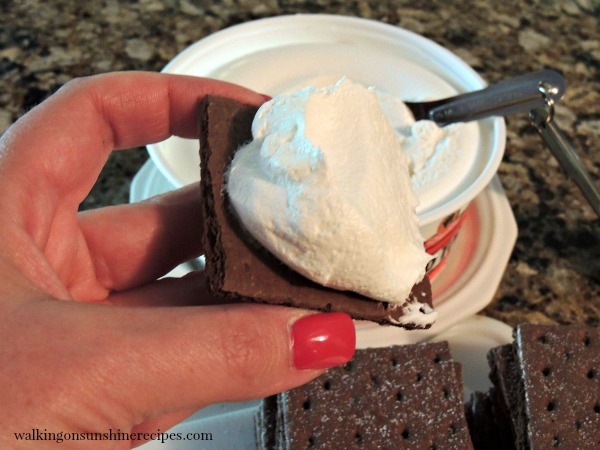 The only two ingredients you need are chocolate graham crackers and a container of Cool Whip or frozen whipped topping, it’s really that easy! Make sure you save and print out the recipe below! Break or cut the graham crackers into half. Spread two tablespoons of the whipped topping on top of one cracker. Cover with another cracker to form a sandwich. Wrap them individually in plastic wrap. 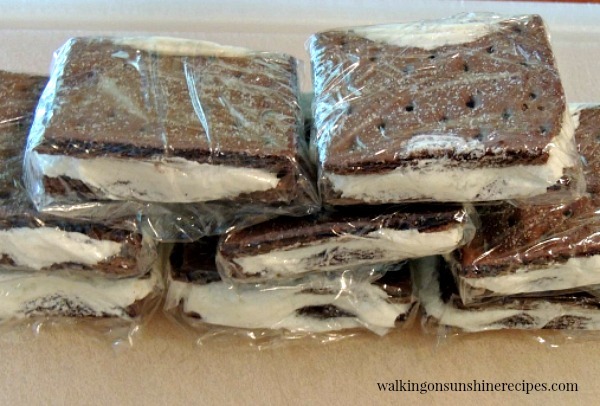 The next time you're craving something sweet, reach for one of your prepackaged "ice cream sandwiches" and enjoy! It really will satisfy you without all the calories. 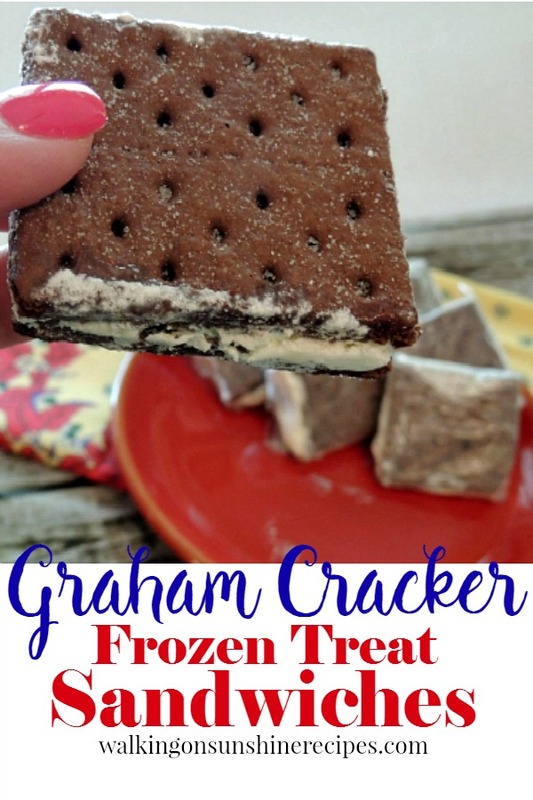 Try these Cool Whip Frozen Graham Cracker Sandwiches for when you're trying to watch what you eat but you still want something sweet! Divide and break the cracker squares along the perforation marks. Spread about 2 tablespoons of the frozen whipped topping on top of one graham cracker square. Place another graham cracker square on top to form the sandwich. 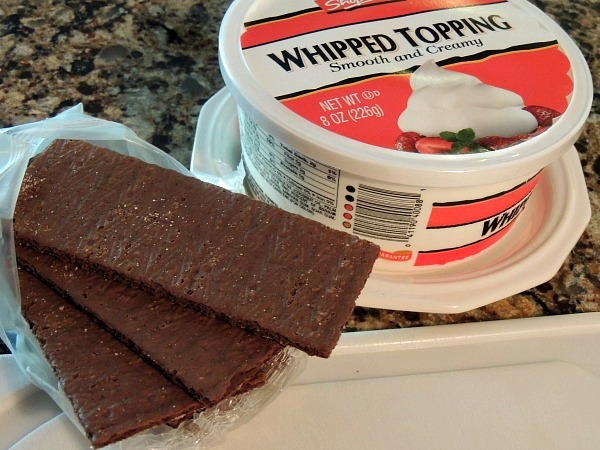 Continue making sandwiches until you have used up all the frozen whipped topping. Wrap each sandwich individually in plastic wrap and place in freezer. There are 130 calories in one full chocolate graham cracker. There are 11 calories in one tablespoon of frozen whipped topping. They are really yummy! I love the peanut butter mixed in too! Thanks for visiting! What a great idea and it fits my theme this week – keeping the kitchen cool. Of course they are definitely delicious too. These look delicious! What a great idea, Lois! GREAT idea! Even though it is FREEZING here, I could go for one of these now too! Love this recipe Lois. I know grampy would love these and to be honest so would I. Thanks so much for sharing. I'm pinning and sharing. Love only 2 ingredients too!!!. remember the ratio. Anyone know? My recipe doesn’t call for yogurt. This recipe is just for spreading Cool Whip on the graham crackers and freezing. Thank you for visiting. Hey there fellow Queens girl! Hope your son likes the recipe. 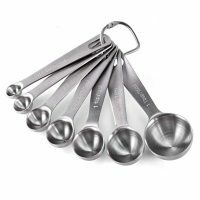 These are a favorite here in our household. Enjoy your weekend and thanks for visiting. Hope you come back again! There is about 152 calories per frozen sandwich. I’ve updated the printable recipe card to show this as well. Thank you for visiting! Thank you!I haven’t tried adding strawberries but it sounds so good! Love joining your parties. thanks for this great idea perfect for saving my diet but allowing a treat as well. I DO love ice cream, so much so that I can’t bring it in the house. This is a great alternative!!! Pinned, and featuring you next week on Talk of the Town! Thanks! I appreciate all the sharing and the feature! I made these and they’re a hit in our house! Fyi I didn’t flash freeze them, nor wrap them individually in plastic wrap. Simply, I made each sandwich then placed them all in a large plastic container with a lid, then put them in the freezer. They store perfectly this way, and won’t fall apart by removing the plastic wrap. A quick, light and delicious treat to appease my sweet craving. I’m glad that worked for you! I did try that and found they all stuck together. But looks like you were successful!! Glad you enjoyed the treats. Thank you for visiting!